The WORCESTER PARK Blog :: So this is Christmas! 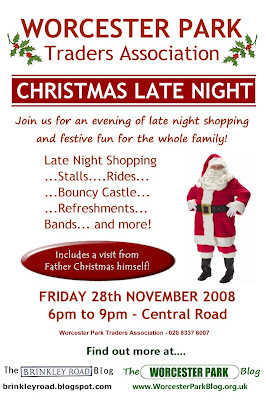 Being observant erudite blog readers, you have no doubt already spotted posters appearing in shop windows up and down Central Road promoting the Worcester Park Trader's Association 'Christmas Late Night' which takes place on Friday 28th November from 6pm. And as you all have such a keen eye for detail, you no doubt spottted The Brinkley Road Blog and The Worcester Park Blog logos at the bottom of these posters? Yes, of course you did. It's all because in the true spirit of the festive season myself and The Brinkster are setting aside our online blogging rivalry to bring you one simple and unified message: support your local retailers this Christmas. In the weeks running up to Christmas, we'll be bringing you a flavour of what Worcester Park retailers can help ease the stress of your Christmas shopping. In the meantime, put Friday 28th November in your diairies. From 6pm, Central Road will be lined with festive stalls, funfair rides and awash with bands and entertainment for all the family. Many shops in Central Road will be opening late into the evening to allow you to do a spot of late-night shopping Worcester Park style. Father Christmas himself will be there to kick off the proceedings. Hope to see you there!